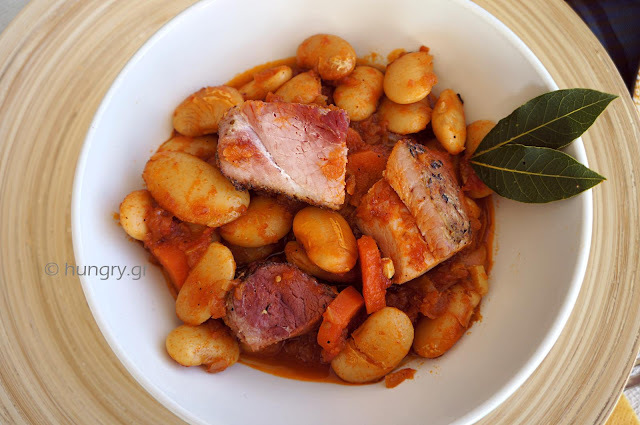 Giant beans along with syglino (corned pork) from Cretan Sfakia, sprinkled and smoked with aromatic herbs of the mountains of Crete (throuby or summer savory, thyme, sage). 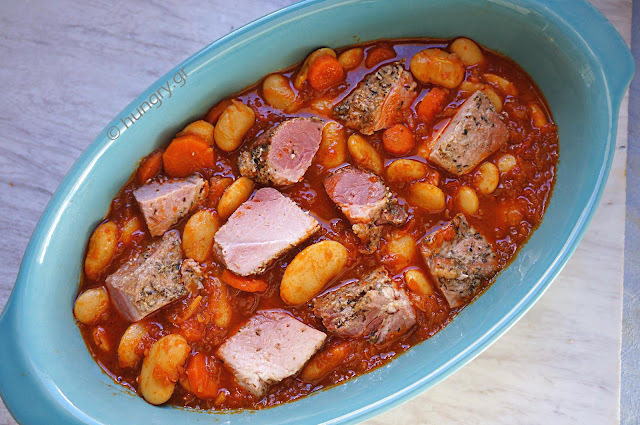 A delicious and hearty dish, where the coexistence of beans with smoked pork give a proteinaceous, delicious meal with excellent combined components. The syglino in Crete was made from many years ago and was kept in clay pots with glyna (pork fat). Whole pieces of delicious pork meat is smoked and fried. It was the meat preservation a way to have it during the whole year. Similarly prepared and is found in Mani, in the Cyclades and elsewhere. From the night before soak the beans in lukewarm water. 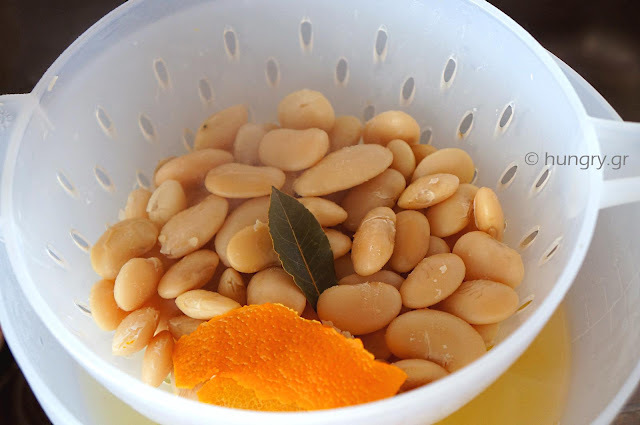 The next day rinse the beans and boil them thoroughly in fresh water with the bay leaf and a bit of orange peel. 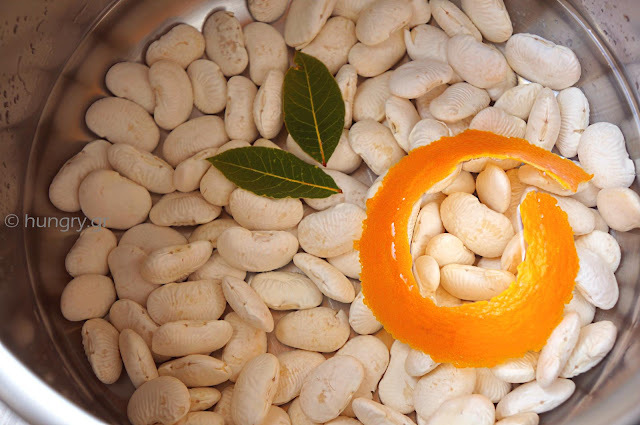 Drain beans and throw away the orange peel and bay leaves. We keep some of the water in which they were the boiled beans. 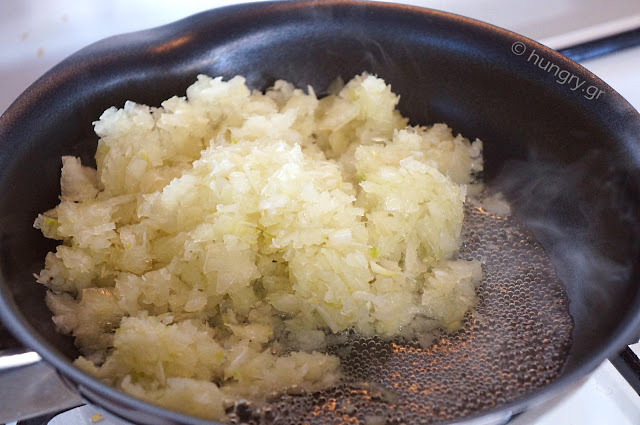 In a pan pour half the oil and saute the onion and chopped garlic until golden. 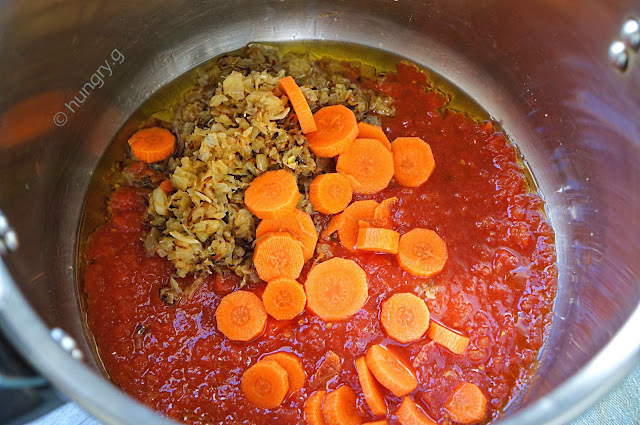 In the pot add the remaining oil, fried onions, chopped tomatoes, slices of carrot and a little of the water that boiled beans. 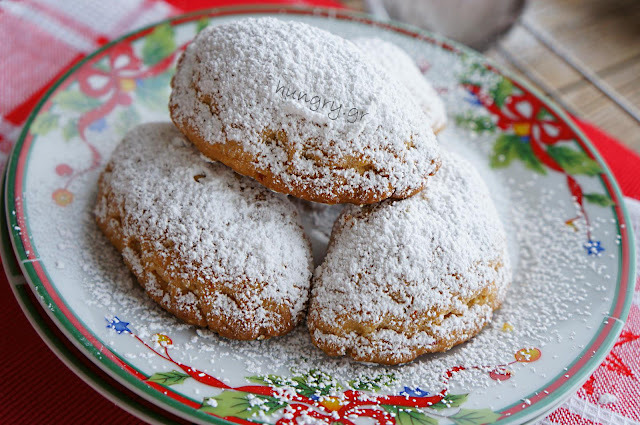 Season with salt, in moderation, and sprinkle with a little paprika. Let them boil well and towards the end, that would have been cooked, add the boiled giant beans. Mix well and if necessary add a little water for the food to boil. Empty the contents of the pan into the ovenproof pan, place over the syglino, cut into smaller pieces and put it in the oven grill for 20' to roast slightly and to highlight the flavors and aromas of smoked meat. 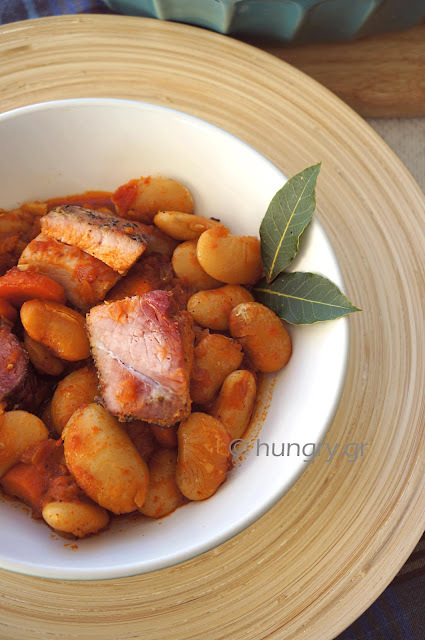 Delicious giant beans with a stew of caramelized onions, carrot slices and sundried tomatoes in oil. 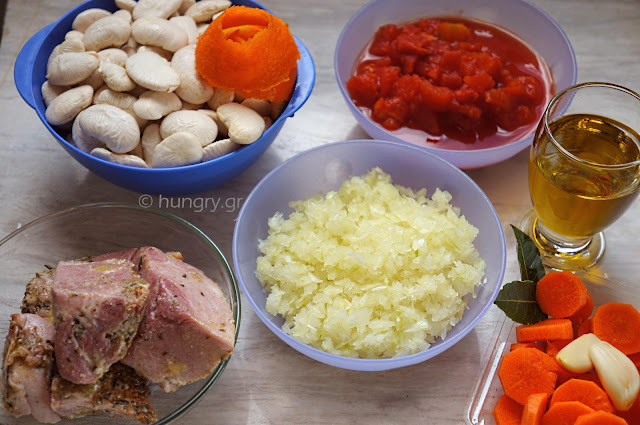 All mixed with spices and herbs to increase the taste. 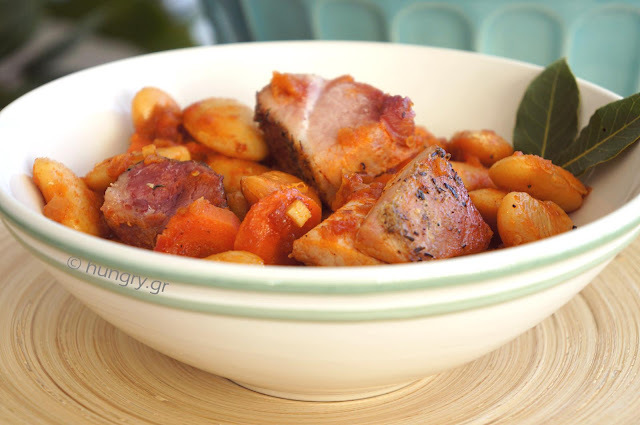 Balanced, to have a finish of a perfect stew without meat. Black giant beans, black to brown, but there are black to dark purple - blue. A particular variety of beans, delicious, full in protein, antioxidants, plant fiber, low fat and they care for the proper functioning of our heart. A super food! Dessert food. 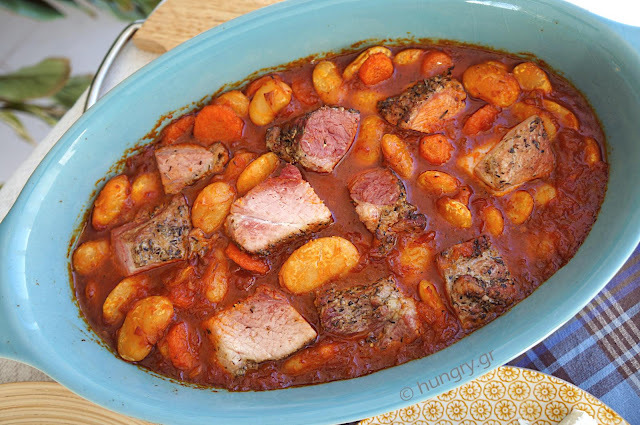 Delicious, hearty, economical and favorite for too many. 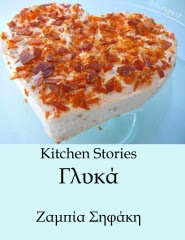 Along with feta cheese and olives, warm loaf of bread and a glass of wine is a unique, tasty treat. The combination of celery with giant beans is tasty and proper nutrition. 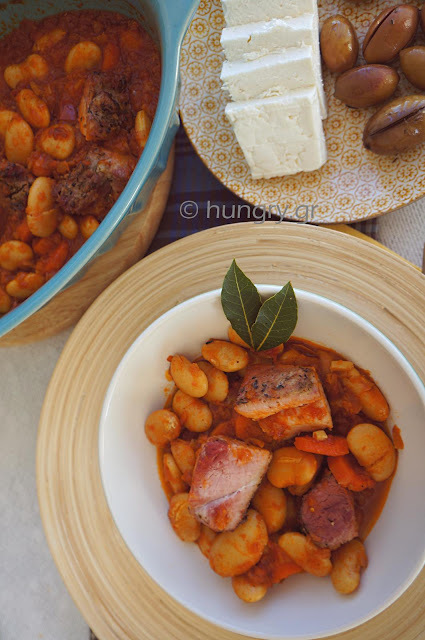 The traditional cooking in a Dutch oven (Gastra in Greek) in the oven increases the flavor. Those who have not seen this dish with a positive look, it is time to reconsider. 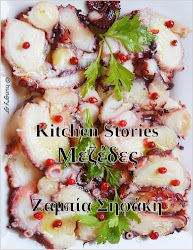 Considered one of the tastiest dishes of traditional Greek cuisine, a dish that Greeks and visitors foreigners love. Simple yet so delicious and useful for our diet. 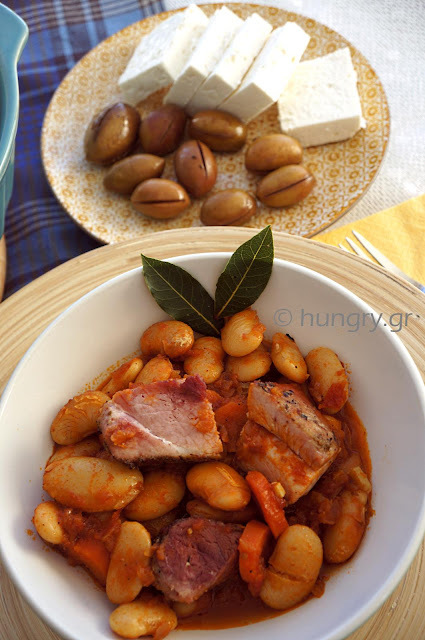 Ingredients such as the Greek giant beans, tomato, onion, and olive oil, well tempered, for a delicious result!